Cigar City – The Barley Whine . Nothing wrong with that. The big dark malts play to style and pair well with the coffee notes. An uncommon, but solid coffee beer admixture. Like the Bollywood addiction to re-interpreting Hollywood films like The Matrix 15 years after the fact, we are also known to return to the scene of the crime. What is the best pumpkin ale is a question we explored recently, with Southern Tier’s Pumking coming out on top. And while The Barley Whine could never drink all of the pumpkin beers brewed in the U.S. this year, there are so many great ones available we felt another round was only fair to give a better sampling of all the variety in this style. So let us get right to it: Best Pumpkin Ale Part II. As always, we blind tasted brews of a similar style, rated between 1 and 10, with .5 as the only allowable decimal. Beers are ranked based on style, not metaphysical eminence as libation. Cigar City – Good Gourd: #1 (tie). Brassy in color with a mild savory/sour nose. Sweet roasted malty notes battle a subtle boozyness (8.5& ABV) as the front palate is hit with a gourdiness, modest spice, and just enough hops to balance the sweet. Tied for our favorite brew. Unfortunately not distributed in our locale. Rivertown – Pumpkin Ale: #1 (tie). Translucent brown with a soapy, spicy aroma. Minimal spice in flavor with subtle nutmeg, but huge pumpkin fruit taste. Not too sweet, with some maple. St. Ambroise – The Great Pumpkin Ale: #3 . Light brown, smelling strongly of pumpkin pie spices. Taste is classic pumpkin ale with more p.p. spice and a lot of sweetness. Dry finish did not appeal to everyone. Thirsty Dog – Pumpkin Ale: #4. Another light brown brew with solid spice scent. A bit thin as a brown ale, with nutmeg, allspice, cinnamon and pumpkin. Like St. Ambroise this plays right to form and does it well. Jolly Pumpkin – La Parcela: #5. A curve ball. Funk/sour on the nose, big time. Cloudy gold, this beer, in the middle of all the pie inspired samples, tastes super sour. Some gourd, spice, and possibly oak creeps in, but this is a lot of sour. Everyone liked this, but not everyone got the ‘pumpkin ale’ nature. Buckeye Brewing – Pumpkin Dead: #6 (tie). Translucent brown, with weak carbonation. Pumpkin is there and spice is present but barely. Overall some hops in the finish but nothing to write home about. Tommyknocker – Small Patch Pumpkin Harvest Ale: #6 (tie). Dark brown, almost opaque, the darkest by far of the nine sampled. With a roasted malt and spiciness in the nose, this beer brings only a slight p.p. spice profile along with a roasted malt backbone. Not much pumpkin or anything else. Shipyard – Smashed pumpkin: #8. Sweet nose, smelling of mothballs. Its like a pumpkin pie that has been sitting in grandma’s dresser. The p.p. spice and pumpkin fruit are there, but booze and more mothballs dominate. Good carbonation and a clean finish. Buckeye Brewing – Pawpaw: #9. “The North American native pawpaw (Asimina triloba) is a temperate tree fruit in the mostly tropical custard apple family, Annonaceae.” according to Kentucky State University. It is the largest fruit native to North America, and has a tropical fruit flavor. The beer was a translucent amber, smelling of Juicyfruit and caramel. Taste was of mild sweetness, but with no pumpkin or p.p. spice. None of the tasters had a history with the pawpaw fruit to know if the flavors were legit. Round two brought us more diverse, delicious beers. 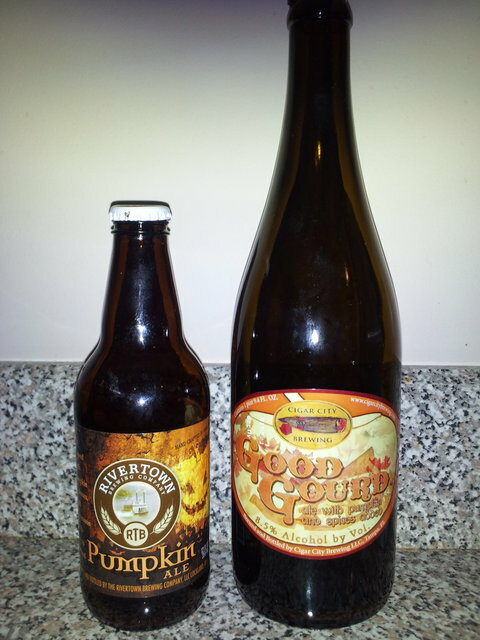 The Rivertown Pumpkin brought more pumpkin flavor than anything previously tasted, and the Cigar City Good Gourd was a complex, modestly sweet delight. In our area neither of these beers are easily available, although the Rivertown more so than the Tampa based CC. The Canadian St. Ambroise was a very nice brew you may find at your local store. In the Cleveland area, Thirsty Dog has bottled a complex treat that delivers at a higher level than more famous, nationally distributed competitors. While Southern Tier’s Pumking may be the most universally palatable of all pumpkin beers, this tasting revealed four more autumnal ales worth hunting down for pumpkin lovers. If you can find any of the top four, they will not disappoint. Of the southern breweries unavailable in Cleveland, Tampa Bay’s Cigar City is one of the most intriguing. Founded only a few years ago, this craft brewer is a rarity in a state where frozen drinks are king. And CCB wasted no time however getting the beer world buzzing. In addition to creating exciting new brews like their recent Imperial Milk Porter that was aged in whiskey barrels, CCB has partnered with the Bruery on a collaboration Belgian ale, and started two innovative series. One of these began by tapping into the Ybor City cigar rolling history. This upstart created a limited line of beers aged in cedar known as the Humidor Series. One of the first to get this treatment was their regular IPA, the Jai Alai IPA. For our first Cigar City tasting we decided to hold off on the fancy wood-aged stuff and try the regular, available year round version of the Jai Alai IPA to give us a taste of what CCB is starting with. On a recent trip down south we decided to pick up the Cigar City Jai Alai IPA to see what the Google+ like excitement was all about. Made with 6 different hops, this is an American styled India Pale Ale without question. The hops are huge and the alcohol by volume at 7.5% is much higher than most AIPAs. The malt load is sticking closer with tradition however. A small brewer shooting for world-class greatness in craft beer fans favorite style. Did they achieve it? Steve’s Take: Big white head gives way easily. Bouquet is a blast of citrus and herbs. Taste is a wonderful delight of ….hops and a balance of sweet almost bready malts. Finish is a biting. A hop lovers delight. Dave’s Take: Tropical fruit/grapefruit hops. Nice balance. Good drinkability and mouthfeel. A solid IPA.